Bella is a very different kind of bunny than I am. Did you know she is exactly twice as big as me? I weigh 3 pounds and Bella weights 6 pounds. She does so many things different. 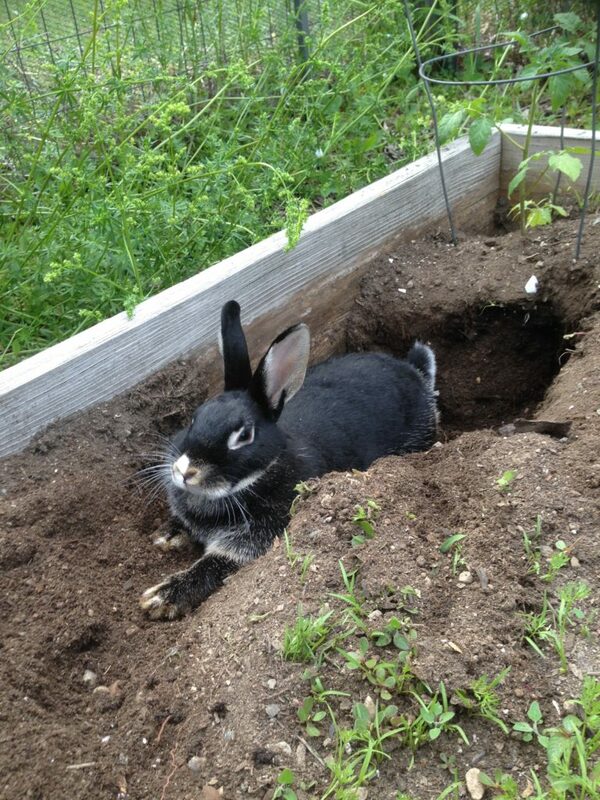 I like to dig just a little bit but Bella likes to dig all the time everywhere. 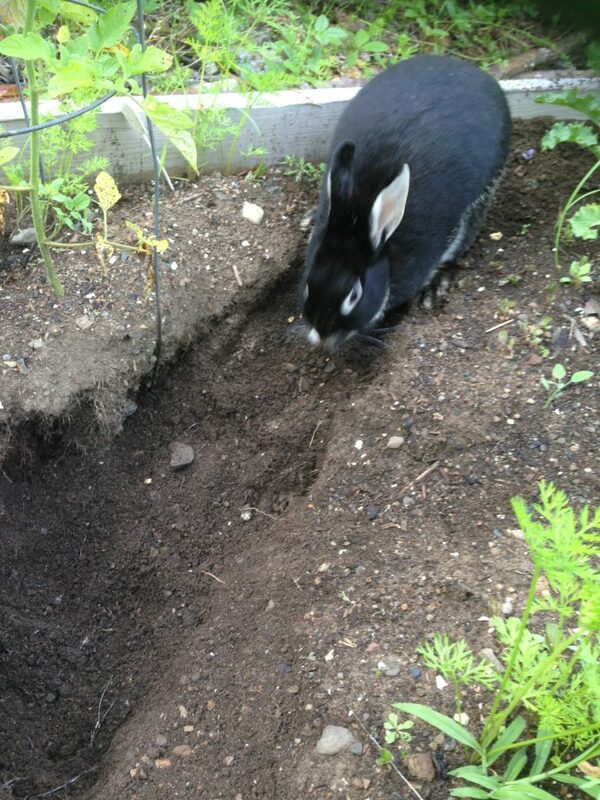 In our garden Bella dug 4 different holes. When she starts digging she sometimes doesn’t stop. She dug one that was so deep she even disappeared in there. Bibi could put her whole arm down it. It was the best rabbit hole we ever had. 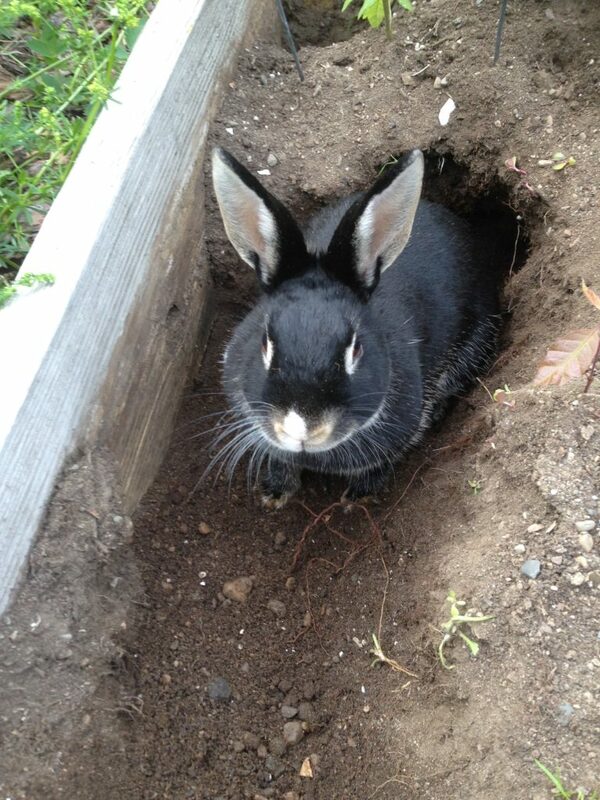 If she lived with the outdoor bunnies they would make Bella digs holes everywhere. Bella pees and poops everywhere. One day Bibi had to take the whole carpet out of our room. It was springtime anyway so she said we could be on the porch. When we moved to the porch everything was different. It didn’t smell like us. It wasn’t my place anymore. Before we moved to the porch I was the bunny in charge and Bella knew it was my house. I don’t know why everything changed. But it changed. 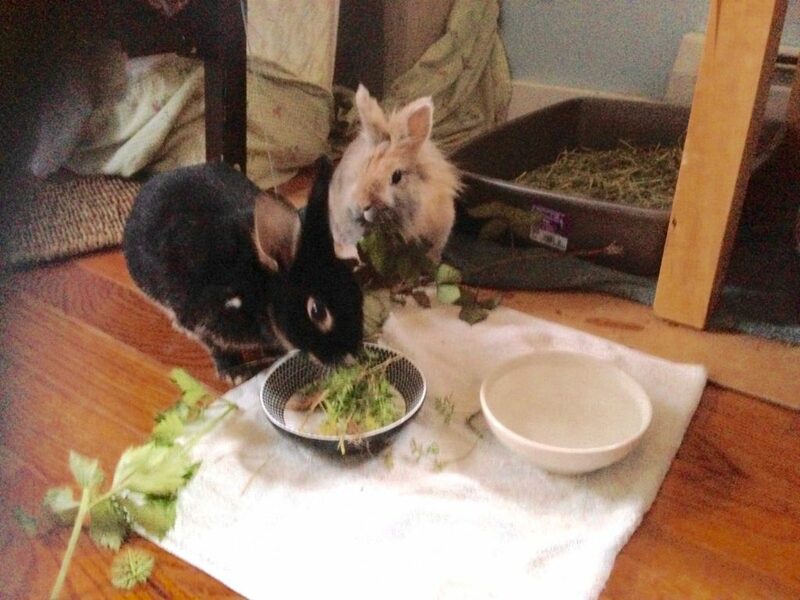 Bella started eating first and I waited for her to finish before I even took any greens or pellets. Bella also chased me around all the time and wanted to jump on me. I was making my little crying sound. 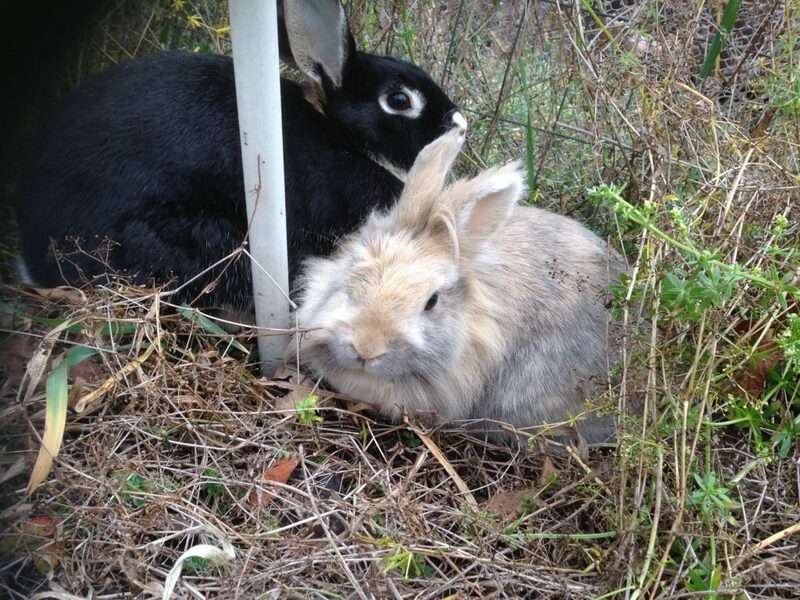 Bibi only ever heard me do that once when I met a boy bunny named Brownie who was chasing me and scaring me. I made that sound so much when I was trying to run away from Bella that Bibi had to separate us. For a long time I couldn’t even play with Bella. She lived on the porch and she could go play in our outside house and I lived in our room with a new different floor where our carpet that smelled like us used to be. Bibi had to play with us and feed us separate. We could say hello a little bit but not be alone together. Bella would always start chasing me and I would cry. It wasn’t fun to play with her when she was like that. We didn’t ever snuggle anymore. When Bibi let her in to play in my room she even peed in my food twice. It was because Bella wanted to be dominant. Bella is two times as big as me and she is stronger and she is younger. When I lived with Rocky the cat I wanted to be dominant. Even though he is a boy cat and it was his house. That’s why I pooped in his cat pan. We had to give Bella an operation to make her not be so crazy and chewing and digging into every single thing and chasing me. It also means she can’t ever have any bunny babies. It made it better. We’re best friends again. Every time Bibi looks where we are we are in the same place together. So now we are telling Bella that we love her and it’s ok if she wants to be dominant we just want her to stay here and always be our bunny. She is the best friend I ever had. I hope you take good care of your best friend even if they sometimes want to be dominant. It’s ok you can take turns.